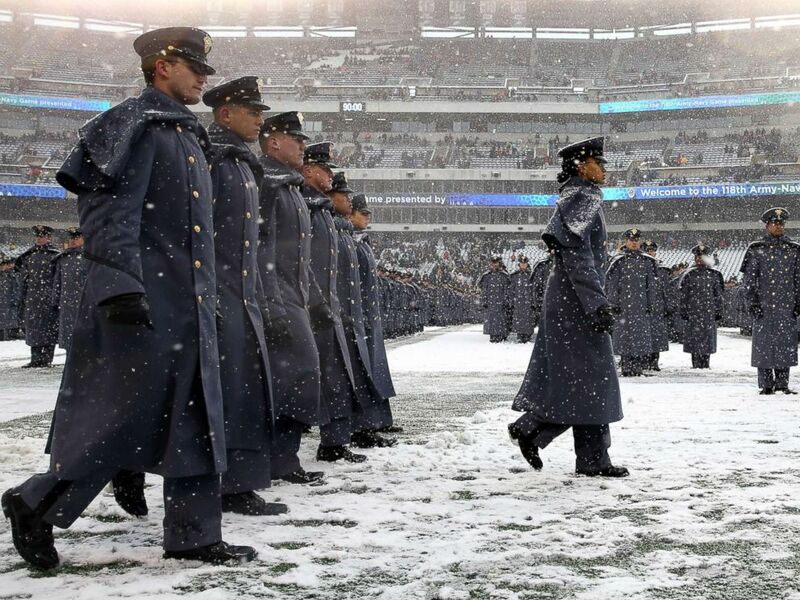 First Captain Simone Askew, the first African-American woman to lead the Corps of Cadets at West Point, stands in formation as she leads the "march on" of Army Cadets before the 118th meeting of the annual Army Navy football game, Dec. 9, 2017 in Philadelphia. A fabled, more than 100-year-old football rivalry played out at today's Army-Navy game where another story also came to the fore. A 20-year-old West Point cadet, Simone Askew, became the first African-American woman to lead the traditional march-on ceremony at the game. 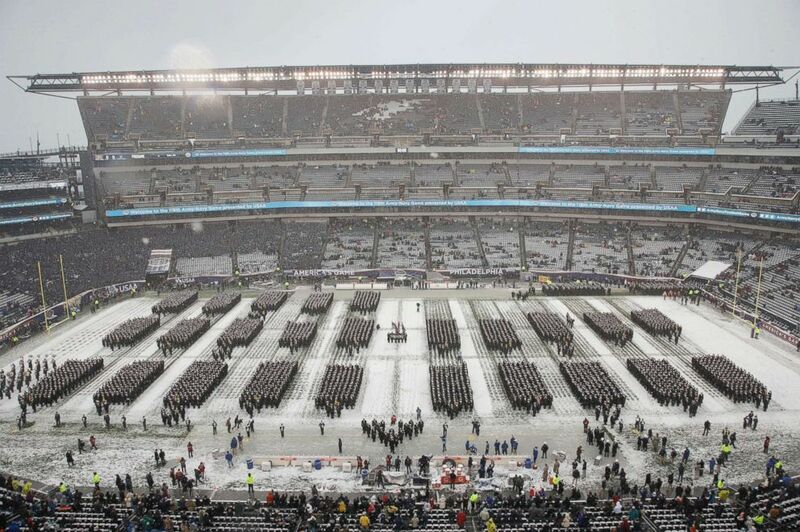 As first captain, Askew, who is also a Rhodes Scholar, led a roughly 4,400-member Corps of Cadets onto the Lincoln Financial Field in Philadelphia prior to the 118th Army-Navy game today. Secretary of State Rex Tillerson administered the coin toss before the game, which Askew's Army team won 14-13 after Navy missed a last-second field goal. Afterward, Tillerson presented Army with the Commander-in-Chief's trophy. 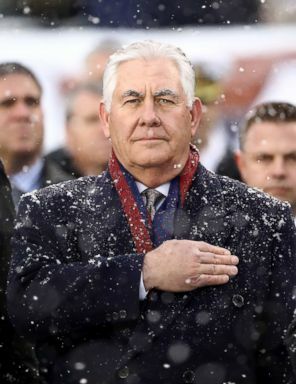 Secretary of State Rex Tillerson stands for the national anthem on the sideline before the game between the Army Black Knights and the Navy Midshipmen, Dec. 9, 2017 at Lincoln Financial Field in Philadelphia. Askew's mother was excited about her daughter's leading role in the pregame march, but in a way, she wasn't entirely surprised. Askew got the idea to attend a military academy when as a young girl she saw this same ceremony, called the march-on. “She literally saw the [Navy] midshipmen march in formation onto the field and rose up from her chair and pointed at them and said to me, 'What does it take to lead that?’” her mother, Pam Askew, told ABC News of the first Navy game that Simone, of Fairfax, Virginia, attended. “I could see that spark in her and that it really just ignited a desire to attend a service academy," Pam Askew said. "She was just drawn to this." In the march-on at the Army-Navy game, uniformed West Point cadets and Naval Academy midshipman take the field in perfect formation in what has become a traditional display of military pageantry. Navy Midshipmen stand in formation on the field ahead of an NCAA college football game between the Army and the Navy, Dec. 9, 2017, in Philadelphia. Pam Askew was a single mother when she would take Simone and younger daughter Nina to Army-Navy games, giving them hot chocolate as they bore cold weather to watch the Army Black Knights versus the Navy Midshipmen. The mother said she was excited for her daughters to see female cadets and female midshipmen and for them to think that could be them one day. Pam Askew recalls times she saw hints of Simone's future as she grew up. While Simone was vacationing with her family in West Virginia, she led her younger sister Nina and some boys to line up into formation in a mock march with her as commander. She was around 7 at the time. Simone Askew, first captain of the Corps of Cadets leads the "march on" before the game between the Army Black Knights and the Navy Midshipmen, Dec. 9, 2017 at Lincoln Financial Field in Philadelphia. As a high-schooler, Simone stayed up until 2 a.m. baking cookies for the janitors of her school whom she felt had been overlooked during a teachers' appreciation week, her mother said. "Whether it’s school president or homecoming queen, or even brigade commander, to me, that’s not as important as her willingness to serve others regardless of the title," Pam Askew said. And although it was a Navy football game that inspired Simone to aim for a military academy, she chose to join the Army military academy. "Simone truly exemplifies our values of Duty, Honor, Country. Her selection is a direct result of her hard work, dedication and commitment to the Corps over the last three years," Brig. Gen. Steven W. Gilland, commandant of the military academy cadets, said in a statement announcing Simone's appointment. 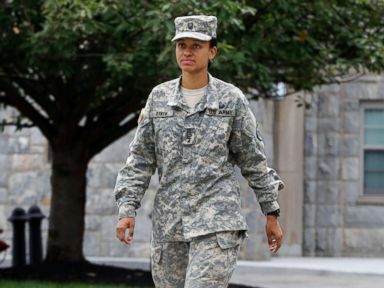 Cadet Simone Askew, who has been selected first captain of the U.S. Military Academy Corps of Cadets for the upcoming academic year, in West Point, Aug. 14, 2017. As First Captain -- a role she's held since August 14 - Simone Askew is the highest-ranking cadet in the chain of command. She previously led the 1,502 cadets as the regimental commander of Cadet Basic Training II -- or "Beast Barracks" -- the second part of a grueling six-and-a half-week training. Once she graduates from West Point in 2018, Simone Askew has plans to attend Oxford University on her Rhodes Scholarship and attain a master's degree, and after that aims to become an Army engineer. Her sister Nina, 17, has been conditionally accepted to West Point as well, according to their mother. 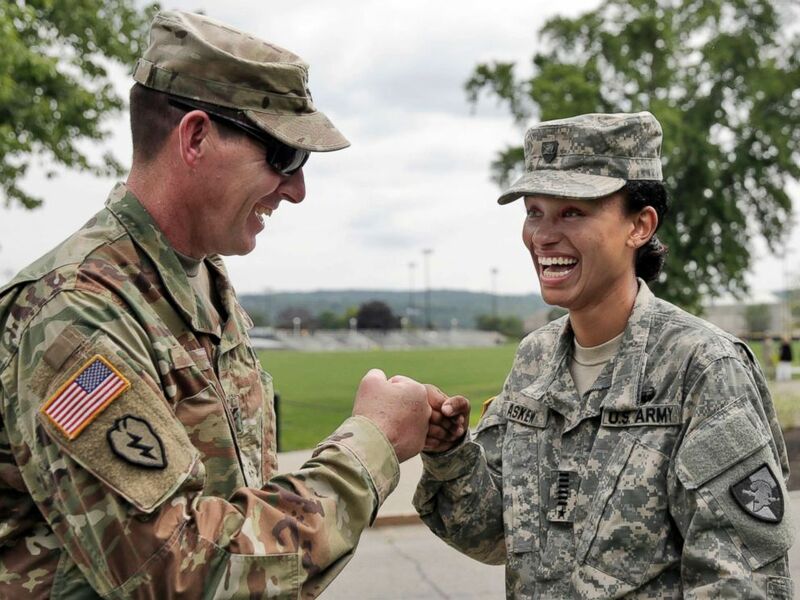 Cadet Simone Askew, right, talking with Brigade Tactical Officer Col. Brian Reed, has been selected first captain of the Corps of Cadets for the upcoming academic year at the U.S. Military Academy in West Point, N.Y.